He loves to climb all over his sisters! At first, no one thought there was anything unusual about the baby gray squirrel. 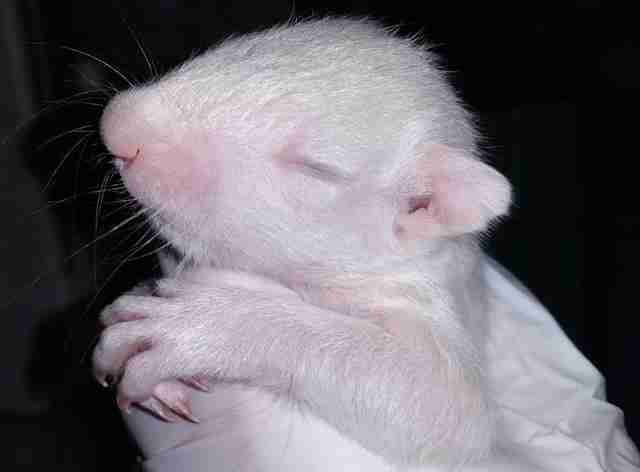 At 2 weeks old, the squirrel - named Filbert - had started sprouting fine white fur instead of gray. According to wildlife rehabilitator Linda DeLorenzo, many squirrels look "white-ish" at that age - they're born hairless and pink, then start getting "peach fuzz fur." As the weeks ticked by, however, Filbert's five littermates turned gray-brown, but Filbert's white fur thickened. The litter of six squirrels arrived at Antler Ridge Wildlife Sanctuary in Warren County, New Jersey, after they'd been found abandoned in an attic. 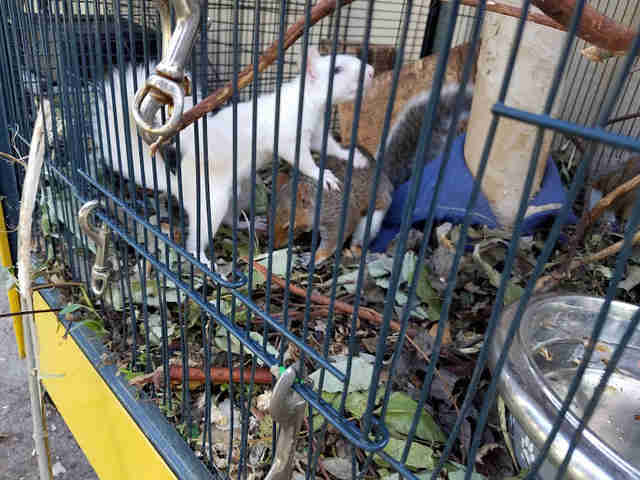 Since opening in 2008, the sanctuary has rescued and released more than 1,600 Eastern gray squirrels, but the volunteer staff had never come across a white squirrel. "We were all surprised Filbert was so white," DeLorenzo tells The Dodo. 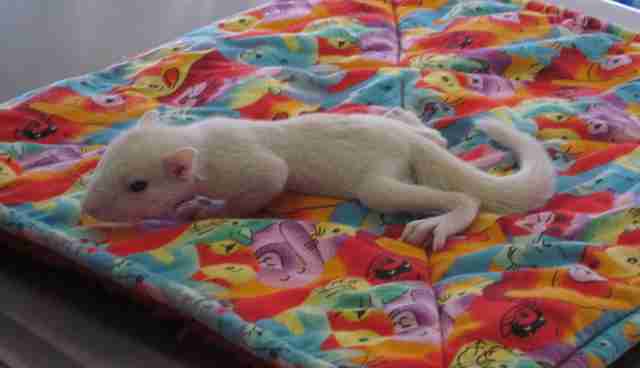 "We were interested to see if he was truly albino or if he was leucistic, which is a partial loss of pigment. 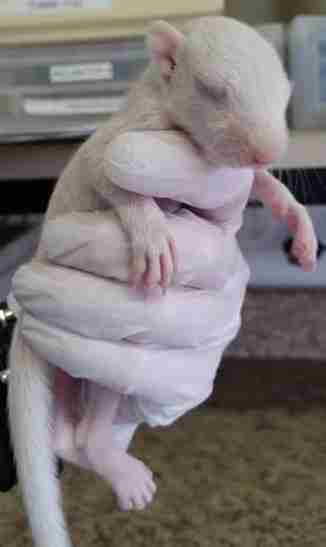 If the squirrel had leucism, he'd have normal dark eyes, but if he was albino, he'd have red eyes." 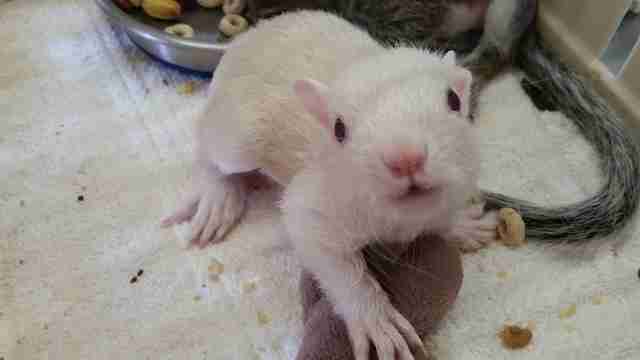 When Filbert's eyes opened at 4 weeks, the sanctuary staff had their answer: His eyes were red, confirming him to be an albino. 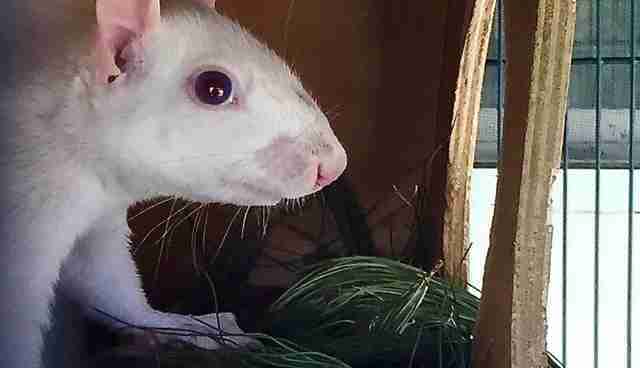 Filbert might look different than his siblings, but he certainly doesn't act differently. As they grew up, they enjoyed doing what squirrels do: hiding nuts and finding them again; chasing and running away from each other; building nests, climbing and jumping. When the squirrels reached 12 weeks, the Antler Ridge team knew they were ready be released back into the wild. However, they decided it would be in Filbert's best interests if he remained at the sanctuary. "His absence of color leaves Filbert without his camouflage and would make him easy prey to the hawks, eagles and owls that hunt squirrels from the skies, and the bobcats, coyotes, foxes, feral cats, dogs and humans that hunt them from the ground," says DeLorenazo. "Also, animals with albinism often have poor eyesight." 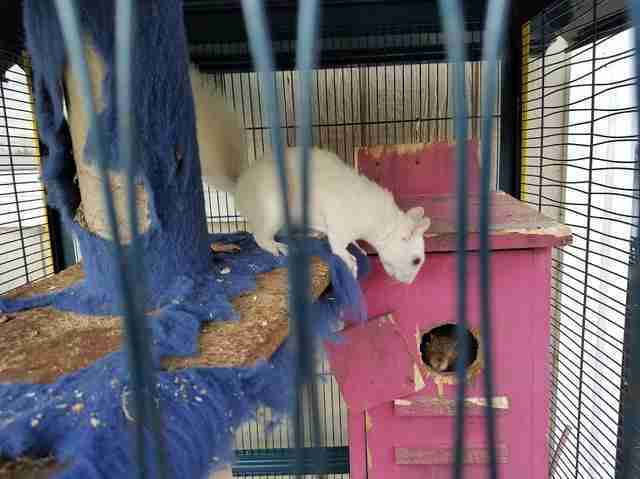 To ensure Filbert wouldn't be lonely, they also kept two of his sisters, Hazel and Macadamia. The three of them live together in a very large enclosure, and they love jumping from branch to branch, chasing each other, wrestling and stealing each other's food. The squirrels also love to groom each other. "Filbert knows he's especially gorgeous and keeps himself impeccably groomed," says DeLorenzo. The Antler Ridge team will also use Filbert for educational purposes to teach students about albinism, squirrel behavior and the squirrel's role in the ecosystem. 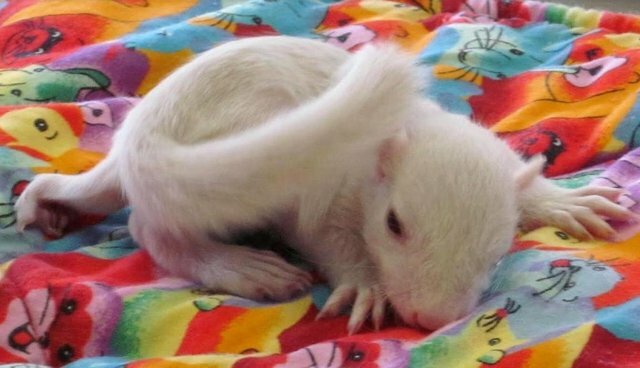 Albino squirrels are very rare. 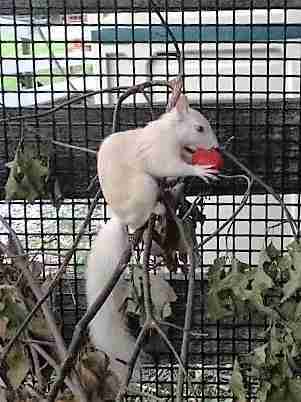 According to University of Texas biologist David Hillis, albino squirrels occur in 1 out of every 100,000 gray squirrels. 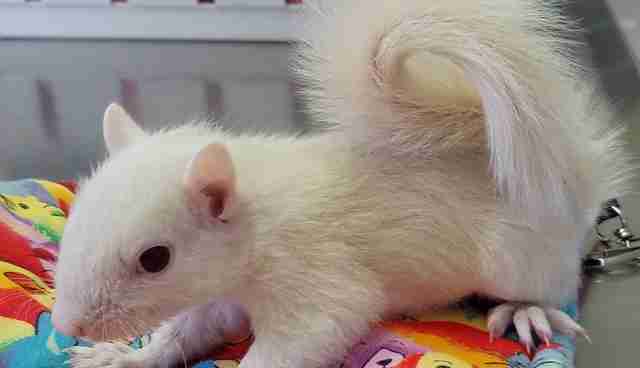 However, the town of Olney, Illinois, has a population of about 150 albino squirrels after local farmers operated a captive breeding program in the early 20th century. In Olney, white squirrels have the right-of-way on every road and sidewalk, and people face heavy fines if they injure, kill or remove a white squirrel from the town. Antler Ridge Wildlife Sanctuary is a nonprofit wildlife sanctuary that is committed to the care of orphaned and injured wildlife in New Jersey. The group's ultimate goal is to release any many animals as possible back into the wild. It runs solely on donations and has an all-volunteer staff. To support Antler Ridge, you can donate here.